I'm not sure why demigod and Thor star Chris Hemsworth forsook me and had adorable children and got a really cute dog with somebody else, but seeing him rocking out at home to his kind of, sort of sister-in-law Miley Cyrus's hit, Wrecking Ball, eases the pain somewhat. Miley's engaged to Hemsworth's brother, Liam Hemsworth, BTW, in case you were living on a deserted island without Wi-Fi and hadn't heard. I grudgingly admit it looks like my Australian intended and his kids are having fun without me. Oh, fine. Go on. Have a look. Can you even stand it? Is he not the best papa ever? Chris Hemsworth posted the video clip on Twitter with the hilarious caption, "What started as a ground breaking music video ended in a savage attack by a cowardly K9. Never work with Kids or Animals. #wreckingball #wreckingdog #daddydaycare #murderonthedancefloor @mileycyrus @liamhemsworth." The elder Hemsworth has been married to Spanish model, actor and producer Elsa Pataky — best known for her role as Elena in the Fast and Furious film series — since 2010. The ridiculously photogenic pair has three ridiculously photogenic offspring: a daughter, India, 6, and twin sons, Sasha and Tristan, 4. Hemsworth tagged his brother and Cyrus on Twitter, and Cyrus also shared the video with three heart emoji attached. 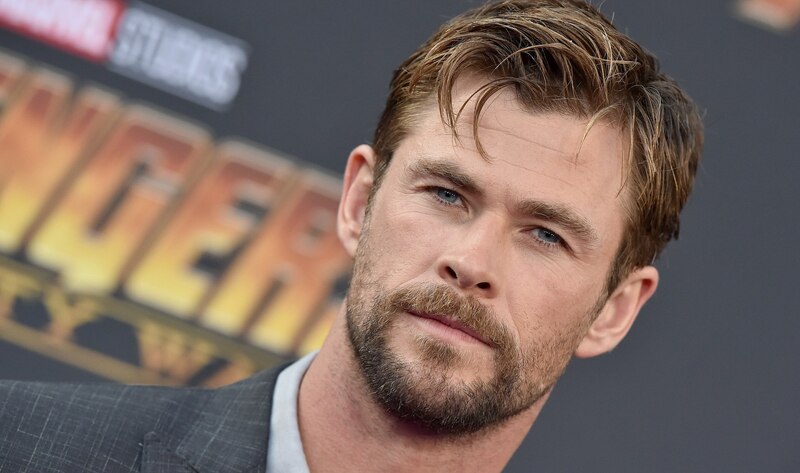 In an interview with SiriusXM earlier this year, Hemsworth spoke warmly of Cyrus and said they get on really well, though he denied speculation that his brother and Cyrus had married over the holiday season. Hemsworth clearly adores life as a family man — and as a feminist. His Instagram post on March 8 in honor of International Women's Day featured him and his wife on some breathtaking coast (ugh) and the caption, "Happy international women’s day to my beautiful wife, daughter, Mum and all the incredible women out there for their strength, compassion and courage to make the world a better place and let’s not forget that the women of tomorrow are being grown and nurtured among the children of today! Yet another reason to #defendchildhood for all children today and every other day!" I'm sure he's got really ugly toes. Or something. There's got to be something, right?